Is it a bird? No it's a plane. 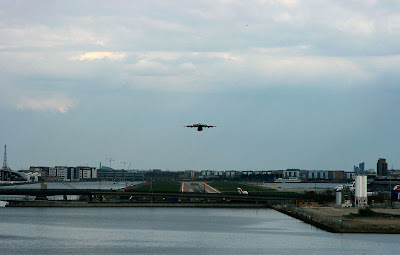 Taking off from London City airport. Bringing people into central London since 1988. Although it is almost next to the Excel centre (see yesterdays post) this will not be where president Obama lands today. No, Airforce one arrives at Stansted airport. A 40 min drive away from London. However he will just pop into London via one of the helicopters he is bringing with him. Not sure how the rest of the entourage is arriving into central London. I guess the police sirens will give me a clue. Will keep you posted of events around town. So of course I did not believe you, did I? No no no ... I can see the ruffle of feathers from here. So a click to enlarge ... golly gosh. Oops ... she is right ... sorry Mo. The authorities discourage us from parking in places like this to shoot. The threat of terrorism is their excuse. Great shot.I'm sure you gonna do well about bringing the events into pictures. What a big beautiful metal bird !!! I love having this eyewitness account of the coming events. Thanks Mo. It really looks like a bird! Great photo! Fantastic photo. Just let us know if you see Obama around. Ciao. A. Cool shot! Good luck with the traffic jams. Oh yes, I too thought it was a bird but on clicking for the enlarged view found what an impressive shot it is. I guess it is a heavy transport plane clawing its way into the sky. I like the runway lights below it also.